The information on this page was first collated in 2011 when the most recent aerial photography dated from the start of 2005. That aerial photo was used as background for all the maps. 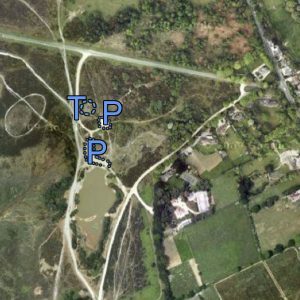 “P” marks the car park areas and “T” marks the prehistoric burial mound. Based on the maps at that time, the main tracks and the extent of the gravel pit and/or the pond (if these existed) have been over-laid on the 2005 aerial photo.